Egypt’s vice-grip on squash is storied. 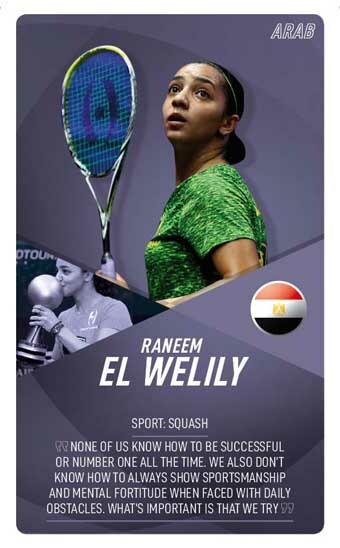 If you peek the women’s rankings for example, you’ll see that three of the top five all hail from the north-African country and atop sits Alexandria’s Raneem El Welily. Hailed as squash’s ‘most enigmatic’ star, the 30-year-old’s tussle for top spot with friend and compatriot Nour El Sherbini has really captured the imagination over the last couple of years. Considering she last held the coveted No1 ranking in 2015 – a feat which saw her become the first Egyptian female in any sport to become world No1 – it’s a real testament to El Welily’s spirit that she is back on top. 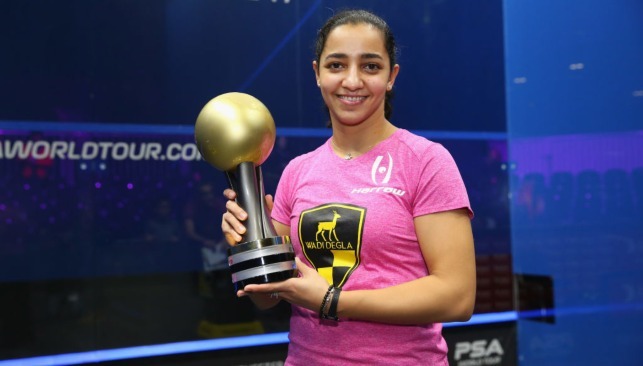 One of the most prominent Arab athletes, ‘The Egyptian Marvel’ is set to bring her attacking brand of squash to the court in what will be another fascinating season. – The Egyptian star is married to fellow squash player Tarek Momen and they have been dubbed as squash’s power couple. – The 2017/8 season saw El Welily finish runner-up in both the British Open and World Series Finals before claiming the China Open and US Open at the back end of the year. El Welily is a massive jigsaw puzzle enthusiast and is a self-proclaimed Sudoku addict. Jabeur is a true trailblazer for women’s tennis in the MENA region. The Tunisian is the highest-ranked Arab female in the game’s history, currently standing at 55 in the world – a figure that is likely to rise even further in the future based on recent form. She demurely laughed when asked about the prospect of becoming the “Naomi Osaka of Africa” – Asia’s only World No1 to date – in the build-up to the 2019 Dubai Duty Free Tennis Championships, but the question posed to the outgoing 24-year-old was anything but ridiculous. So much of what she has done to date in her ground-breaking career points to a special player. Back in 2011, Jabeur became the first Arab female to win a junior Grand Slam title when she lifted the girls’ singles trophy at the French Open in 2011. At Rolland Garros, again, in 2017, she became the first Arab lady to make the third round of a major. Last October in Moscow, a first Arab female appearance in a semi-final or final at a WTA tournament was recorded – beating three top-eight seeds along the way. She is so far ahead of the MENA field, that no other woman from the region is ranked within the top 400. What makes her journey to the cusp of the top-50 all the more special is the fact she barely had any immediate role models to inspire her. Only compatriot Selima Sfar has ever reached comparable heights, peaking at No75 all the way back in 2001 when Jabeur was seven. Her flamboyant style and extrovert personality provides ample inspiration for the next generation, while support from President President Beji Caid Essebsi to push her to become “one of the greatest players in the world” shows how intrinsic she’s become to the Tunisian sporting scene. Jabeur has already done tremendous things – with the promise of much, much more to come. – Jabeur has set a target to enter the world’s top 30 in the immediate future. 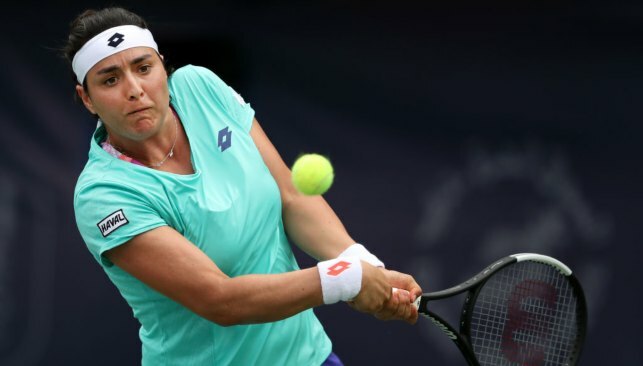 – She narrowly missed out on a second third-round appearance at a major during Wimbledon last year, losing 5-7, 6-4, 9-7 against Katerina Siniakova. – Jabeur keeps family close, hiring husband Karim Kamoun as her fitness trainer. – A career-best 2018 actually began in disastrous circumstances with a 0-5 record. – Since she turned pro in 2010, she’s earned more than $1.1 million. At the age of 13, Jabeur left the family home in Monastir and moved to join the Tunisia national team. 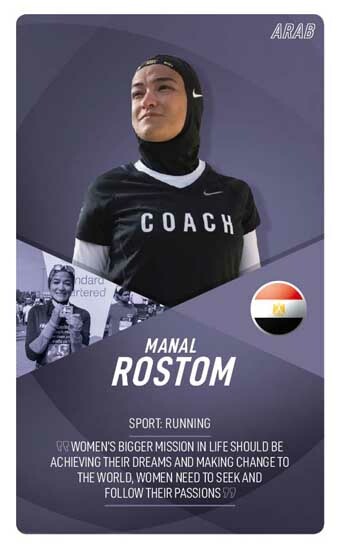 Manal Rostom’s passion for empowering women is magnetic. Whether it be through her inspirational social media channels or just in general conversation, she is the type of person who needs to be heard because you know that what is being said is significant. The force of her words are backed up by the weight of what she has achieved. The Egyptian has climbed three of the world’s highest mountains (Kilimanjaro, Kenya, Elbrus) and completed three gruelling athletic endeavours having raced at the Dubai Marathon, China Wall Marathon and New York City Marathon. She has raised funds for Syrian refugees and refugees across the Gulf in addition to supporting Autism charities while also helping to build the first ever Pediatric Oncology Unit in Palestine. There is genuinely too many initiatives to list but you can appreciate just how influential Rostom is to women – covered or uncovered. She has used her notoriety to break down barriers and defy stringent societal rules that prevent women from fulfilling their aspirations and taking part in an active lifestyle. 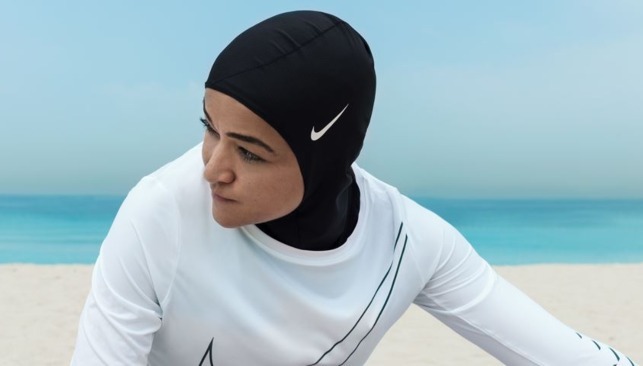 These and many more reasons are why Nike saw Rostom befitting of becoming the global face of the Nike Pro Hijab. – Rostom founded the Facebook group Surviving Hijab, a community of almost half a million members that aims to empower hijabi girls. – In March, Rostom has set her sights on Everest as she will lead a group of 12 women ascending to base camp. – To a gain a measure of her impact, Facebook’s COO Sheryl Sandberg met with and praised Rostom for her incredible work through the Surviving Hijab page. The Nike trainer actually left behind a lucrative career in clinical pharmacy to fulfill her true passion.